I've written a number of times about how the tragedy of maternal mortality, so much a reality for women around the globe, has hit home for me since living in Kenya. I've written about the unbearable sadness that emanates out through multiple family layers, leaving an epicenter of emptiness where a mother's love should be. About the unfairness of it all in a world which can well afford to address the problem. About the glaring disparities mothers face in anticipating what should be one of the loveliest experience of their lives - excitement for some of us, fear for others. Truth is I HATE writing about this. It feels like shouting into a void. It feels ineffectual. It provides me a bit of emotional release, but does nothing to address the problem. I've been so honored to be a part of the Global Moms Relay, an online advocacy effort created by the UN Foundation, the Gates Foundation, the Huffington Post and others. The idea is that each day for 60 days a mother, an advocate, a celebrity, (this hapless blogger) will contribute a post about motherhood, and for everyone who shares post, the Gates Foundation will contribute $5 to a related cause. They'll keep contributing up to $500,000!! My post ran yesterday in the Huffington Post. It's not a feel-bad story. It's the story of a mother, like so many voiceless woman, who is picking up the pieces after another woman's death in childbirth. These stories, especially from a continent which is typically either feared or pitied, are rarely told. This is Esther. The deck is stacked against small twins, whose mother perished bringing them into this world. 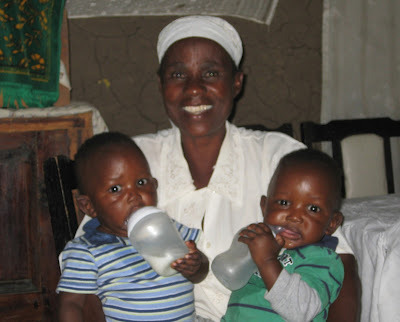 But not with their grandmother Esther giving them loving and attentive care. I like to think of this story as kind of the other side of the "matching grant" idea. We, in the wealthy world, contribute money to try and reduce some of these needless disparities. But we should never forget the immeasurable strength of the people who face their own daily hardships to help their friends and family. We contribute some on our end, but it is often "matched" (and then some) by the power of family, love and duty on the ground. If you take 3 seconds to share Esther's story, 2 things will happen: You will be acknowledging and spreading that particular often ignored story of maternal strength. And you will unlock $5 from the Gates Foundation to help the Mobile Alliance for Maternal Action, which is using mobile technology (pervasive in even poor rural areas) to reach and support women who are more vulnerable to maternal mortality. Great post Kim - I shared on facebook and twitter but it's not your post that comes up. With both shares from your Huffington Post article I ended up with Christy Turlington Burns's Making the Connection between Technology and Maternity instead of your post. A good conclusion helps to give a lasting impression to the readers. The conclusion will not discuss any new topics. The conclusion has significant content about the topic. It is the last opinion about the topic. In the finish, you can add some question to think and outline an action that needs to be taken. The essay topic is not a common topic to explain. It needs some reason about why you picked this topic as your thesis and how it matters to you. The conclusion should include the details about why should this matter to the readers. In the essay paper, the writer explains the topic in many directions. First, the writer explains the topic to give some idea about the topic to the readers. Then, explains the values of the topic. It continues with the assumption of the debates. The conclusion may include the idea of the consequences and implication of arguments. If your topic is about a thing which needs some course of action then recommends the action to be taken in the conclusion. Use relevant expert opinion to your conclusion if needed. Always drive your paper through inspiring the readers with surprising contents. You have to avoid some things in your conclusion. It is not a place to simply repeat the thesis. Do not do that in your paper. You have discussed the point are prepared in the body to support your thesis. Never start a new topic in the conclusion. Include your point of view about the previous points. Don’t become wordy. Use a simple word with good meaning. For the school-level essay, the essay doesn’t need to be too long. Well prepared good content is enough. Refer buy essays to get new ideas about essay writing. They have explained clearly about the writing process and tip to prepare an effective conclusion.